In this era of cut-throat competition, compromising on quality should be the last thing to do on one’s list. Although competition has always been a part of the human nature since the time immortal, however, I am especially referring to competition from the aspect of business and entrepreneurial success. Akin to all other fields of business, the survival of a web design business highly depends upon the quality and authenticity of the product. Gone are the times when you could put anything to everything on the Internet without giving it a second look and the users were not bothered much. One of the attributes of the Internet technology is that it has enlightened and empowered users all over the world to an extent that now even the simplest of the audience can sense any pitfalls. Therefore, the phenomenon once limited to theories and books only, is being adopted as a regular practice by most big and small web design companies i.e. usability testing. Any new website these days is tested for its targeted users just like a new model of automobile or a new drug. Its color combinations, layout, content, graphics and even the placement of icons is gauged with a continuous trial and error methods till it ripens to a perfect form, ready to be launched for general users. Usability testing is not important only because it helps the webmaster eliminate the bugs and errors, it is also important because it can be a good way of knowing the strong points or focal points on a website in development. Once the focal points are determined, the web designer and developer can build on these points and can place the most important content there. Perhaps this is the reason that scholars and practitioners from the field of psychology, media, communication and design research over and stress upon the application of usability testing in all user-based products in general and web design in particular. Although we have greatly discussed the inevitable importance of usability testing in a web design, however, like every other step in the web design process, it requires some guidelines and a certain code of conduct to be followed. By the dint of the following points, the most important and most common guidelines, I will jot down some tips in the form of four main steps that can make usability testing easier for all web designers and developers out there. The very first thing to keep in mind when you start testing the usability of your web design is that this process should be carefully conducted and no aspect of it should be brushed under the carpet. Same caution should be given to sampling or gathering the ‘guinea pigs’ so to say. In order to get the maximum and effective results always choose an array of people from different backgrounds, sociology-economic conditions and walks of life. However, the sample should not be so random that they would not understand the concept in the first place. If, for instance, you are conducting usability testing for a website targeted on youth, your sample people should be young individuals from different backgrounds and educational level etc. In other words there should be one mutual aspect that would bind all your participants together. Also, it is appropriate not to let the samples know about the aim of your testing because then they might get biased in their opinion that will ultimately affect your results. Panning out the test is very important in order for it to be effective. Laying out the plan of execution, deciding a place to conduct this test, lining up the participants according to their availability and making sure that all equipment involved in the test is working properly, all constitute the pre test of the usability testing process. Introducing the participants to the basics of your research beforehand is another aspect of the pre test, however, make sure that the information is brief. If the website to be tested requires certain account to be created, ensure that it is done by all participants beforehand, they can either o it themselves or you can do it for them and share the account information with them before starting the test. Also, ensuring the privacy of their opinion and seeking their permission to use the date collected from their observation should also be in your pre test list for proper usability testing. Moreover, you should not give an absolute raw form of your website to the participants to test it. The website that is floated for usability testing should be very much complete in its own self. Prepare a questionnaire if required. Almost every aspect and element of the website should be tested before launching it. 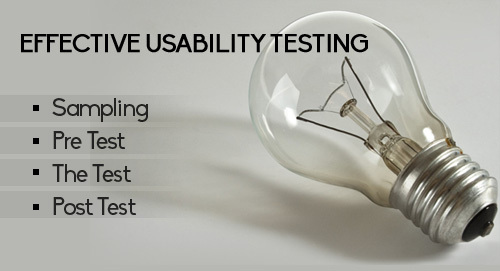 If not all, then at least all key features of the website should have a usability test. Once the pre test is done, give a specific time to the participants to visit the website and check out its different aspects. Instead of giving instructions, provide them with scenarios. Try to leave the room or the specific environment when the participants are indulged in testing. Remind the participants that whatever things they notice, observe or feel erroneous will be asked about in the later stage and in order to facilitate their memory, provide them with a note pad and pencil to take things down as soon as they notice. Most of the time, a test is followed by an interview or questionnaire with the participant. Once the participants are done touring the website and testing its different aspects, make them comfortable for the interview. You can also hand them a printed questionnaire and give them a specific time to fill it. In the case of an interview, keep a recording device to your disposal and let the interviewee know that his/her interview is being recorded. Either you take an interview or go for a questionnaire, never forget to put an open-ended question about their opinion or feedback in general. Do ask your participants if they remember some specific things about your website. This will help you in establishing focal points of the website. Usability testing is highly significant process through which almost every new or re-branded website should go through. However, the more important it is the more complicated it gets when you are actually doing it. The aforementioned tips can help you conduct an effective usability testing process and can reap great results for your web design endeavor. Arfa M Waqas is a writer and self-taught graphic designer. She has a dream of making it big with her CreatiWittyBlog. Being e-enthusiasts, she and her husband maintain a web & design blogs. Thank you for sharing these good tips with us and as a web designer of flow.asia i think what you said in this article is useful especially for the juniors. Your post gives some very useful tips on website usability testing. It’s one of the important factor for any website to be successful.